Blowout Sale! Save 74% on the SIPLION Men's Driving Polarized Rectangular Square Sunglasses Metal Frame 1823 Blue by SIPLION at Mas Fashion. MPN: SP1823. Hurry! Limited time offer. Offer valid only while supplies last. SIPLION United States Trademark Office registration number : 87481807 SIPLION provide the most high quality and fashionable,The coolest sunglasses. SIPLION provide the most high quality and fashionable,The coolest sunglasses. Please pay attention more SIPLION Brand, You will find more surprises! Service: We Metal Frame provide 30 Day refund and lifetime Warranty on Frame & Lens. 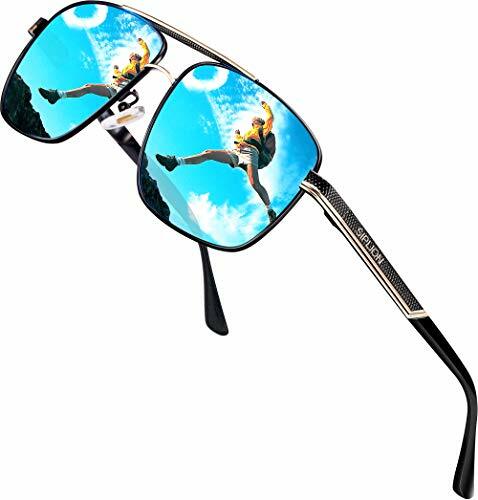 SIPLION Men's Driving Polarized Rectangular Square Sunglasses Metal Frame, High quality solid color lenses, providing great clarity of vision, comfort and protection.User for Daily life, Party, Driving Sunglasses and all Active Outdoor lifestyles! FASHION NOVEL: Classic fashion rectangle polarized sunglasses,ideal for both male and female, use for any climate and weather conditions, perfectly choices for outdoor activities such as walking, driving, shopping, travelling, fishing, taking photos, also suitable as high fashion accessory and daily wear all year round. 30 DAY MONEY BACK GUARANTEE - All SIPLION customers enjoy 30 Day Money Back Guarantee. Customers can return and get refunded if dissatisfied for any reason. You have no risk to try and we always providing excellent customer service! If you have any questions about this product by SIPLION, contact us by completing and submitting the form below. If you are looking for a specif part number, please include it with your message.